The Reelmaster 3555-D (5 inch reel) reel mowers provide productivity, efficiency, and simplicity. The 100 inch width of cut and lighter cut makes it perfect for sports fields. These mowers were designed to be over 20% lighter and much more compact than traditional Toro reel mowers. You get the performance you come to expect from Toro in a size that is not only highly maneuverable, but is also engineered to decrease turf compaction. ENGINE EFFICIENCY: Powered by a 24.8 hp (18.5 kW) Kubota diesel engine. The Reelmaster 3555-D provides plenty of power to climb hills, even while operating groomers and rear roller brushes, yet it uses less fuel per acre than a traditional fairway mower. QUIET OPERATION: The Reelmaster 3555-D has a quiet, low noise design with only 84 dB(A) at the operator's ear & 73 dB(A) at a 25-foot drive by. SUPERIOR TRACTION: The innovative Series/Parallel 3-wheel drive system provides power to at least two wheels at all times. The result is impressive traction in hilly and wet conditions, and minimal wheel slip so it’s gentle on the turf. THREE WHEEL DESIGN: The three wheel design is highly maneuverable which maximizes productivity. Smooth, turf-friendly tires significantly decrease potential for turf tear in tight turns. The 100 inch (2.5 m) cutting width and up to 7 mph (11.3 km/hr) mowing speed make the 3555-D fast and effective. 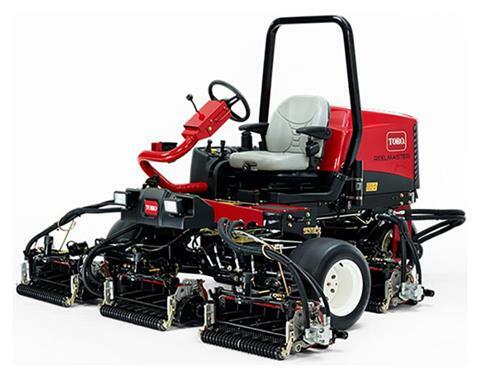 SIMPLICITY: The Reelmaster 3555-D utilize a common platform with other popular Toro mowers, which reduces operator training time and increases productivity. LIGHTWEIGHT DESIGN: With a weight that is 20 percent lighter than a comparably equipped Toro 4-wheel drive reel machine, the Reelmaster 3555-D provides the ideal combination of turf friendliness and productive performance. EDGESERIES™ REELS: Dual Precision Adjustment (DPA) cutting units – featuring Toro’s EdgeSeries™ reels combine to deliver a consistent, high quality cut and superior after cut appearance, while reducing maintenance with improved reel edge retention. Transport - 0 - 10 mph (0 - 16.1 km/h) forward transport; 0 - 3.5 mph (0 - 5.6 km/h) reverse.